Where the Atlantic Ocean meets the North Sea, there lies a channel of water that separates the island of Great Britain from the closest point in northern France?La Manche (?the sleeve?) or, as we know it, the English Channel. For almost as long as time, this narrow channel of icy, cold water that separates the two continents has fascinated mankind, and many have attempted to bridge the divide by swimming across it. The distance may not seem far, if you are standing on the White Cliffs of Dover. Glancing across the Channel and viewing France from afar, the distance at its most narrow point is about 21 miles (34 km). But if you swim the Channel, the tides will push you from side to side, and make your path look more like the letter ?S?. The actual swimming distance can be twice as much as it seems. Each year, 20 to 30 people attempt this ?open water? swim, but since 1875, the distinction of success has been held by few. Stormy weather with unmanageable tides, icy cold temperatures and hypothermia often thwart their efforts. Thankfully, calm waters prevailed for AIM Member George Brunstad on August, 28, 2004, the day he set the world record for becoming the oldest person in history to swim the English Channel. George succeeded in 15 hours and 59 minutes, just two days after his 70th birthday. By doing so, he eclipsed the record set by the 67-year-old Australian Clifford Batt, in 1987. Despite worldwide praise and acclaim, George thinks of his effort in terms of a noble cause. 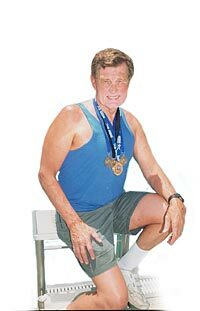 A deeply religious man, George committed the swim and all of its fund-raising proceeds to the Center of Hope, a charity that he and his wife, Judy, established for needy children in Haiti. (www.channelofhopeforhaiti.org). The inspiration to swim for charity came to him one evening after returning home from a mission trip to Haiti. ?In the twilight of my sleep, I had this image in my mind, with a voice telling me, ?Here?s an opportunity?you could do this? to help the children.? Then, on his 69th birthday, he announced his plans for swimming the English Channel. With his wife?s approval, the marathon would be conducted for charity, and for the glory of God. George recalls the thrill of those final moments of the swim when he looked up from the dark waters of the Channel at 1:12 a.m. GMT (it was 2:12 a.m. in France). He caught a glimpse of the beach and could see the distant lights of the town of Calais. Nearing the shore, his two official escorts from an accompanying guide boat joined him in the water with their light sticks to guide him, and to give measure for the official record. With their light sticks glowing in the water, they looked at George and said, ?Let?s go!? ?The boat?s flood lights came on, I pulled through the water hard, and a few strokes later my left hand hit the sand on the beach of France,? says George. ?Then, I called out, ?God is good. God is great. Thank you God!? ? With the tidal conditions on that day, George swam a total distance of 32 miles (51 km) across the Channel. George and Judy Brunstad, of Ridgefield, CT, enjoy AIM BarleyLife? and have been AIM Members since 1998. George is a member of the US Master Swimming organization and teaches swim lessons for youth at the local YMCA, where the children fondly call him ?Grampa George.? Prior to the English Channel event, George ranked first in men 70-74, in the 10th FINA World Masters Championship swim held in Riccione, Italy, June 2004.